There is evidence the Syrian passport found near the body of one of the Paris attackers is a fake. Following Friday's deadly assault which left 129 people dead, French authorities found a Syrian passport near the body of one of the perpetrators. That passport, with the name Ahmad Al Mohammad, was found beside the body of a man who blew himself up outside the stadium where a soccer match was taking place between France and Germany. In the days since the attack multiple copies of that passport have turned up. A reporter with England's MailOnline bought a forged Syrian passport with that same name. Serbian police have also arrested a person carrying the passport in the name of Ahmad Al Mohammad, with all the same identifying details such as age, height, and place of birth. Authorities believe the passports are all fake, and were forged either in Syria or Turkey. Officials with the European Union agency Frontex, which is responsible for border controls, say the number of people trafficking in fake Syrian passports is rising. Meanwhile two other bombing suspects have been identified as carrying false Turkish passports. Islamic State has frequently said one of its goals is to stop refugees from fleeing Syria by any means possible, and tells refugees they are committing "a major dangerous sin" by attempting to flee the war and entering countries where they will be assimilated or integrated into "Christianity, atheism or liberalism." The group has used photos and video of children who have drowned in its propaganda, telling refugees they are throwing away their "lives and souls" by going to Europe. 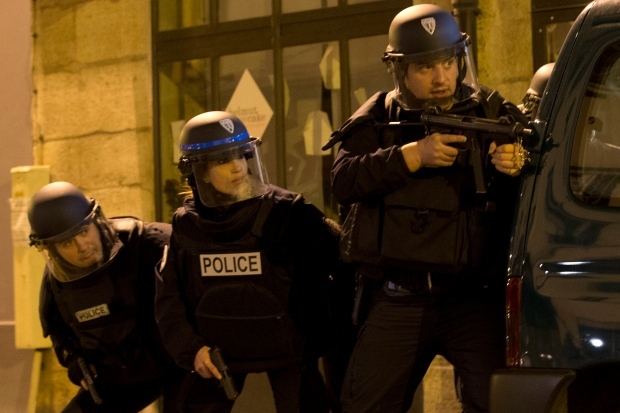 Four of the five attackers so far identified were French citizens. An international manhunt is underway for 26-year-old Salah Abdeslam, who was born and raised in Belgium. Police believe he took part in the attacks with his two brothers -- one of whom is dead, and the other was arrested and later released. Mohammed Abdeslam later went on television to plead for his brother to surrender to police. French police are hunting for a second fugitive they say is directly involved in the deadly Paris attacks. Abdelhamid Abaaoud, who was raised in Brussels, is believed to be the mastermind of the assault.